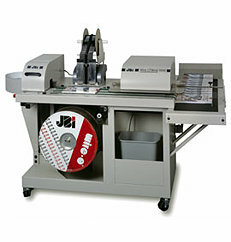 The Semi-Automatic James Burn Wire-O Binder 3500 provides high-speed Wire-O finishing ‘on-demand’ from cost-efficient spools. Producing anywhere from 500 to 1000 books per hour, the Wire-O Binder is super-fast, yet simple to operate. The Wire-O Binder 3500 features an instantly adjustable user-friendly ‘touch screen’ electronic controls with size changeovers in only 2-5 minutes. This machine automatically cuts the wire to length, feeds and positions the wire for insertion; accurately sends book to patented closing station, and then delivers the finished book to standard pile reception unit, without the need for stops or paper guides. This operator friendly machine is so easy to use there is no special training required and features large table-top workstations which help reduce fatigue. The Wire-O Binder 3500 finishes 3:1″ & 2:1″ pitch Wire-O sizes from 1/4″ to 1-1/4″ with skip binding available for calendar hangers. There is an optional hanger feeder for a simple “plug and play” unit which inserts the calendar hangers from reeled hanger spool or from loose hangers. The versatile Wire-O Binder is designed to work alongside the highly successful Alpha Doc and DocuPunch Automatic Punching Machines, to accurately finish a wide variety of documents, including oversize covers and tabbed sheets, for all Wire-O sizes up to 1-1/4″. Together, these machines are the perfect high-speed Wire-O finishing solution for today’s modern in-plant, digital and ‘on-demand’ printing environments, where ease-of-use, versatility and productivity are a must. If you have any questions or are interested in purchasing the Wire-O Binder 3500, visit us at SpiralBinding.com. We have great pricing on a full line of Wire Closers. Call us at 1-800-631-3572 for more information!